Travel to France and uncover the secrets of this romantic country! If you like this free game, try Trip to Italy: Travel Riddles. Have a fantastic trip to one of the most beautiful countries. Travel to France and unlock its secrets through a series of puzzles set in the capital city of Paris, amazing landscapes of Champagne and Provence, Courchevel ski resort and the jewel of French Riviera – Cannes. Earn dozens of achievements, get free gold to charge the powerups, blast through challenging levels and set the best score. 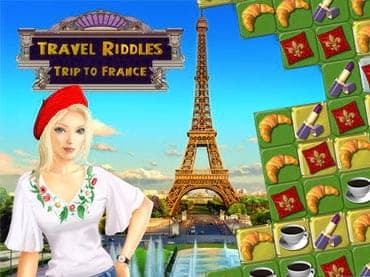 If you have questions about Travel Riddles: Trip to France game, please contact us using this form.